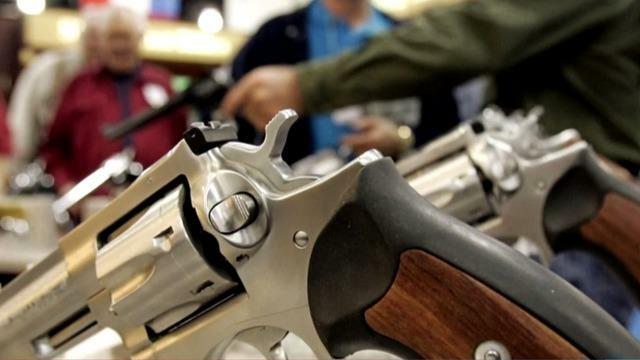 CBS News/YouGov poll on guns: Safe or scary, free or dangerous? On the anniversary of the Sandy Hook mass shooting, divisions over guns in America run deeper than policy differences. To most gun owners, guns are "part of what makes America great" (53 percent). They also say guns make America "free" (61 percent) "strong" (55 percent) and safe (59 percent). For many non-gun owners, guns make America "dangerous" (55 percent) and "scary" (38 percent) and represent "one of the country's biggest problems." Most Americans (63 percent) believe that mass shootings like those in Las Vegas, Newtown or Orlando can be prevented, but there is a split between gun owners and non-gun owners. Half (51 percent) of America's gun owners believe mass shootings are unfortunately something we have to accept in a free society. Most non-gun owners (67 percent) say mass shootings can be stopped if we tried. Both sides say they're frustrated over the current state of the gun debate, and gun-rights supporters and gun control advocates mistrust each others' motives. Suspicions abound: Most gun owners suspect that gun-control groups are trying to give government more control over people and think gun control groups are trying to take away all guns. Non-gun owners think gun rights supporters are trying to arm themselves for a larger conflict. Non-gun owners do not see gun control advocacy this way. Most of them believe gun control advocates are trying to promote public safety (62 percent) and fewer than half (38 percent) say the push for more gun control is trying to take away traditions or a way of life. For gun owners, the right to bear arms is as important to them as freedom of religion and almost as important as free speech and can singularly drive their vote choice more than any other issue we tested. Americans who do not support stricter gun laws worry that any such laws would lead to taking away all guns (76 percent believe so) and 69 percent don't like the idea of the government having databases of gun owners. They also overwhelmingly believe (86 percent) that laws do nothing to stop criminals from having guns. For a majority of gun owners, describing what a gun represents to them includes protection and the ability to defend themselves as the top answer, but most also say it represents responsibility, and freedom. Protection from crime is their top reason for owning a gun (51 percent). Asked what real physical threat they feel they need to defend themselves from, the top answer from gun owners is, almost universally, criminals, muggers and thieves, and a majority (60 percent) also says terrorists. Twenty percent said protecting themselves from domestic violence, friends and family members. Eight in ten are at least somewhat confident they could use their gun to successfully resolve a situation, if needed. Gun owners for whom protection is paramount almost all say they want to defend themselves against terrorists, criminals, gangs. Gun owners who own a weapon primarily out of tradition or hunting, also stress protection and a majority of them see ownership as a responsibility as well. Forty-three percent of non-gun owners call guns in America one of the nation's biggest problems, and men and women non-gun owners feel the same. About seven in ten women who don't own a gun feel laws should be made stricter, and almost half of women non-gun owners feel the country would be safer if fewer people -- or no one -- owned guns. They believe the reason stricter laws haven't been enacted is pressure from the NRA and big donor money. There is agreement on some factors behind gun violence, many of which focus on the individual -- irresponsible gun owners, people with mental illness, gangs and criminals -- much more so than violence in popular culture (Hollywood movies.) Most gun owners approve of the NRA. Three in ten think the NRA's positions are too extreme. Both gun owners and non-gun owners are similarly concerned about the possibility of gun violence at their children's school. Gun policy appears to be more of a make-or-break issue for gun owners than non-gun owners. Nearly half of gun owners say they have voted against a candidate strictly because of their stance on gun policy, but just one in five non-gun owners have done that. Gun owners are also more likely than non-gun owners to have taken action on the issue like contacting a member of Congress or donating money to an organization to express their views on gun policy. The CBS News survey is conducted by YouGov using a nationally representative sample of 2073 U.S. adults interviewed online between December 5-11, 2017. The sample was weighted according to gender, age, race, education, region, party identification, and gun ownership based on the 2016 General Social Survey and included an oversample of 871 gun owners. The oversample was weighted with the final national sample to match national statistics on gun ownership from the 2016 General Social Survey. The margin of error based upon the entire sample is approximately 2.7%.